Be part of a powerful, multi-pronged legal strategy that will finally get foreign-owned factory fish farms out of BC waters! Factory fish farms spew diseases, parasites and waste into the ocean, harming wild salmon and other sea life. The industry has had a particularly devastating impact on the Dzawada’enux First Nation (DFN) of Kingcome Inlet, BC, who sustained themselves for thousands of years with the abundant ocean resources of their territory, in what is today known as the Broughton Archipelago. This small, resilient nation has tried everything to remove fish farms – flotillas, letters, government engagement – but to no avail. Norwegian giants Marine Harvest and Cermaq still operate 10 farms in DFN territory, even after most of their provincial tenures expired on June 20 of 2018. The DFN were left with no choice but to go to court. They hired lawyer Jack Woodward, Q.C. to help them. Building on the landmark decision for the Tsilhqot’in First Nation, whom Woodward also represented, the DFN have devised a multi-pronged legal strategy that is “unstoppable”, says Woodward. 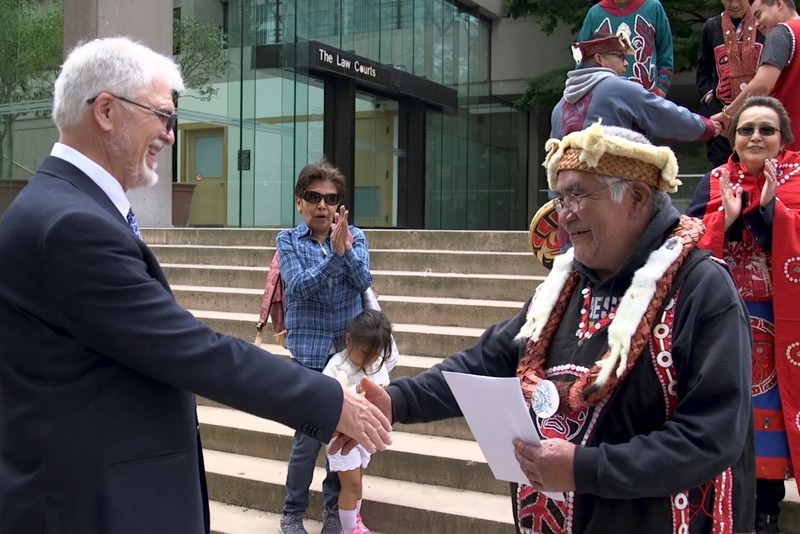 Using a combination of legal tools – Aboriginal title and rights claims, injunctions, judicial reviews, and other legal challenges – the DFN are the best hope for removing fish farms from BC’s coastal waters. “It will cost some money, but once we get this thing moving, there will not be fish farms in DFN territory,” Woodward assures. “I believe that this man can do it for us,” says Melissa Willie. We will get fish farms out of our territory – we just need your support.” The DFN’s success will create legal precedents and blaze a trail for others to follow, forcing the factory fish farming business to adapt and move onto land or go the way of the dodo. Thus, anyone who shares the DFN’s concerns for this industry can only benefit from getting behind their efforts. The process is already under way, with the DFN having filed their title claim on May 28 and begun an injunction process on June 19. Now, they are going to federal court to challenge the licences issued by the federal government which these farms require to operate – the first such case in history. But they need your support to ensure they have all the resources required to see these cases through. Your donation goes directly to the DFN’s Wild Salmon Defence Fund, through a lawyer’s trust account which is regularly audited and held to the highest standards of accountability, according to the rigorous rules of the Law Society of British Columbia. Hello Wild Salmon Defence Fund Supporters! We are proud to announce the opening on January 10 of a new art exhibition at UBC's Morris and Helen Belkin Art Gallery, titled "Hexsa'a̠m: To Be Here Always". Featuring the work of Dzawada'enuxw First Nation artists Marianne Nicolson, Darryl Dawson, Nabidu Taylor, Juliana Speier, Lindsey Willie and Jaymyn La Vallee, the show addresses urgent threats to the land and waters of Kingcome Inlet – notably fish farms – through film, video, social media, weaving, animation, drawing, language and song. If you happen to be in Vancouver, we would be delighted if you would join us for the opening night, beginning at 6 PM at the Belkin Gallery on UBC's main campus (1825 Main Mall). Or check out the exhibit at your own leisure as it runs through April 7. Greetings Wild Salmon Defence Fund Supporters! It has now been 6 weeks since we launched our campaign to support our legal challenges to remove the 10 factory fish farms operating in our territory and we are delighted to update you on the very exciting progress we’re making. All of this is possible because of your generous contributions to our important work to defend wild salmon for everyone. We’re off to a great start but there is still much work to be done and we need your help to let the world know about our campaign and ensure we keep the momentum going! We have already raised close to $13,000 from our Gofundme campaign and on top of that we are receiving close to $12,000 from a recent paddle down the Fraser River, led by our friends at the Wild Salmon Defenders’ Alliance. Proceeds from the paddle are being shared by our legal campaign and another being led by our neighbours, the ‘Namgis First Nation. So that brings our total to almost $25,000 already – which goes a long way to supporting our court cases being led by Jack Woodward, Q.C. We are happy to share this 3-min highlight video of the paddle fundraiser, which will give you a sense of the amazing support we are receiving from our allies up and down he Fraser River and from as far away as Washington State, where efforts by our colleagues have led to the banning of all open net pen Atlantic salmon farms by 2022 (with half of them gone already)! In brief, we have now confirmed that the Government of BC broke the law by failing to consult with the Dzawada'enuxw First Nation when it extended fish farm tenures in our territory without consulting us. This fact hugely strengthens our Judicial Review into the extension of those tenures. This case and our injunction against the fish farms in our territory are both going ahead – we will update you as soon as we have court dates set for each one. We are also excited to announce that we will be filing a powerful Aboriginal Rights case in September in federal court. Unlike the above challenges, which deal with the province and its jurisdiction over fish farm tenures, our Rights claim is squarely targeting DFO, which issues the licences these farms require to operate. This case has tremendous potential to force the removal of farms in our territory. We will let you know when we have a date to file our claim – and will be counting on your help to make a lot of noise in the public and media. We will be announcing a large public event in Vancouver to celebrate the launch and would love to see you there! Stay tuned for more details. As Jack has said before, ours is “an unstoppable legal challenge. It will cost some money, but once we get this thing moving, there will not be fish farms in Dzawada’enuxw territory.” And our victory will pave the way for the removal of many other farms up and down the coast. But in order to make all that happen, we do need to continue raising the necessary funds, so please tell your friends about our campaign! Together, we will win this battle and successfully defend our wild salmon from foreign-owned factory fish farms!